The Annual Fund impacts every student and professor, every day. It is the vital resource that helps to create the momentum that makes Denison a remarkable place to learn. Unrestricted support infuses Denison with resources for day-to-day expenses as well as emerging needs and opportunities. 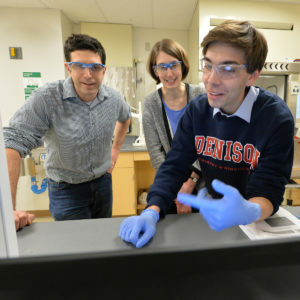 Denison is developing new majors and concentrations that provide students the opportunity to focus on in-demand areas like global commerce, data analytics, financial economics, narrative nonfiction, and health sciences through a liberal arts lens. Your support for these initiatives will help recruit some of the best faculty working in these fields internationally and connect them with internship experiences that prepare them to succeed in the professions. Denison seeks to build upon its exceptional offerings of meaningful global experiences to encourage students from all socioeconomic backgrounds to take part in international learning. Your support will raise Denison’s profile as the standard-bearer for global learning and connect more students with a variety of experiences, both on campus and around the world. From Denison’s signature Advising Circles program that helps first-year students successfully transition to academic life, to professional development opportunities for the college’s world-class faculty—we are committed to supporting ongoing learning and innovative programs. Your support inspires new ways of learning and ensures that Denison remains a pacesetter among the nation’s premier institutions.